These world premiere recordings of two British symphonies are a triumphant event! The project is both national and European in emphasis. The works are performed by a south German orchestra and a British conductor (a Boult pupil) with a Czech recording engineer and issued through a Danish label. The Butterworth work was premiered at the Cheltenham Festival, conducted by Barbirolli on 19 July 1957. It was given its London premiere at a Prom on 29 August 1958. Butterworth's symphony is out there in the dark Northern wastes written in a mood and language that is an extension of the Sibelius Fourth Symphony and the Vaughan Williams Sixth Symphony. It is much influenced by bleak shores, the wilder reaches of Scotland and the winter of 1947 when icefloes appeared in the North Sea. There is a most impressive consistency of mood across its 40 minute span. The allegro molto moderato (I) has the music bowling along with a figure out of the start of the Moeran symphony. The symphony is soon exhaustively exploring a stormy Tapiola, complete with Nielsen references, tempestuous brass and gloomy strings. The following lento molto continues in Tapiola-like wandering; meandering in a cold daze by the side of some desolate lake. At 11:23 there is an outburst from the strings which must surely have been inspired by Sibelius 7. The third movement (allegretto con moto) speaks of pent energy with minatory rumblings and rollings from the kettle drum. The colours are half or even quarter lit with little in the way of facile brilliance. Even the harp touches are 'whispered' as if afraid to lift their head. The finale is marked vivacissimo e furioso (not 'furiososo' as per the back of the jewel case) and by heck it is furious! This movement breaks the spell and casts it to the four wild winds with whirling Manichean violence. Whooping and careering horns and trombones evoke storm breaking over Suilven heights towards Cape Wrath. Screams and hoots roll ripely from the brass. At the close, bells up, the horns call out in visceral energy and resolve into a gong-stroke like the fatal shudders of some great dark creature in its awesome death throes. Incredible! My broadcast tapes give little impression of the ferocity of this finale. Ruth Gipps recent death saddened us all. I particularly recall her kindness in providing me with tape copies of 4 of her 5 symphonies plus the piano concerto and the substantial choral/orchestral piece The Cat. The second symphony is launched by a drummed fast heartbeat and then a great yearning filmic theme is unleashed on the strings returning again at track 7 (although written in a single movement ClassicO have considerately tracked 11 segments separately and these are keyed into Lewis Foreman's description of the work in the booklet). The work mixes a certain Canterbury Tales wartime pastoralism (note the solo violin passage), a Job-like calm, a toy march (echoing Dyson and Arnold) which works up a real lather of a climax, elements of folk tune, restrained soliloquising (adagio section ) carried over into the tranquillo (13) and finally a tart mixture of jollity and solemnity. 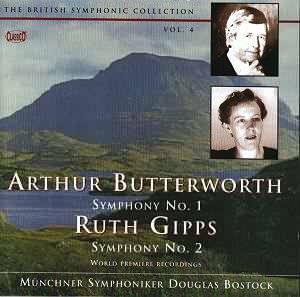 The CD is greatly enhanced by heart-warming photos of Ruth Gipps and a 1969 candid of Arthur conducting the Northern Sinfonia. The booklet is excellently designed and runs to a generous 24pp in English and German. Lewis Foreman wrote the notes and is artistic adviser to the project. Did he write the uncredited notes for the Bax 6 recording I wonder? What next? We know of the Holst Cotswold Symphony disc which will also include other Holst rarities. Can we hope for York Bowen Symphonies 1-4, Dunhill's symphony, Stanley Bate 1-4 (Bate's scorching wartime paean must surely be an early candidate and with their searing performance of the closing pages of Butterworth 1 the team have proven that they are eminently fitted to the task), Bainton's magically lit and phantasmal No. 3, William Baines' symphony, Fricker symphonies 3-5 (and who will reissue existing LP recordings on Louisville and EMI of Nos 1 and 2), the early Stills 1 and 2, Holbrooke's Apollo Symphony, even a selection of W T Gaze Cooper's symphonies. All of this is not to mention Gipps symphonies 1, 3-5 or Butterworth 2-4 (I hope there are to be more Arthur!). The orchestra seem to have been recorded in a kinder ambience than that accorded to the recent ClassicO Bax 6. This is a truly desirable project with the orchestra and recording team getting well into their stride in this cracker of a disc. Volume 4 of Classico's recordings of British music is the best so far. It couples two splendid British symphonies and in performances that are extremely good. It is never wise to compare composers as it can not only be wrong and misleading but hinder their reputation. Arthur Butterworth has stupidly been called the British Sibelius and his music described as Nordic. Of far greater import is his individuality and skill and nowhere it is displayed better than in his Symphony no l.
The performance of an impressive piece is matched by a fine account of the work and a splendid recording. The moods of the various movements are accurately captured and realises the composer's intentions faithfully. There is an excellent orchestral balance and clarity which feature is not only in the performance itself but in the composer's skill and understanding of the orchestra. The long first movement follows in the line of great opening movements. It is serious and profound but never pompous or flippant; it contains memorable material and wonderful contrasts between exciting music, which is always in control, and mysterious quieter passages which are never dull. The movement, rooted in D minor, has an interesting colour and welcome orchestral solos. It has a logic and coherence and a grippingly satisfying structure. While one may say that nothing is perfect this movement comes close to perfection; it is beautifully written; there is neither exaggeration nor understatement; everything is balanced and convincingly effective. The final climax is electrifying and the final eight bars are both simple and beautiful. The Lento is mysterious and expectant music having a strange beauty. It is evocative. There are one or two minor blemishes ... The trumpet entry at bar 9 is not pppp but the viola solo at bar 15 with bass clarinet and oboe is very telling as are the ethereal high strings at bar 23. I do like the way Arthur does not dismiss the bassoon as the orchestral clown. There are occasional effective uses of the harp and how the oboe sings! The climax at bar 47 is staggering and there follows some lovely glowing music for strings. When the harp joins in at bar 83 the sound is simply ravishing. And so I could go on. The movement is slightly too slow, I fear. The Allegretto has a few small disappointments in that Bostock does not honour the long pauses (bar 2 and 4, for example). It is a sort of mysterious quiet scherzo and sometimes these movements are not the easiest to appreciate. Jascha Horenstein said the movement was superfluous. The finale, Vivacissimo e furioso, is very exciting. What a start. It is wonderful virile music with whooping horns (the word whoop is used in the score). There are elegant woodwind solos and an impressive menace in the quieter sections ... and, of course, relentless string writing. The timpani thunders occasionally and the brass snarl. dramatically. The furiossissimo coda (bar 414 ff.) is gloriously wild at times. And there are no variations in speed. The music keeps going. This is not a slow weak 'stop and start' allegro that is an annoying feature of one revered British composer but a stunning tour de force ... A real and brilliant allegro. And watch out for those stunning climaxes. This is truly a very fine and special work. Before I proceed to Ruth Gipps' Symphony no 2, I have to quietly complain that the sleeve note lists tracks five to fifteen concerning this piece thus perhaps implying that it is in eleven sections ranging from 42 seconds to 3 minutes 44 seconds in length. This is completely daft. The symphony is in one movement not fifteen episodes. If this policy is going to be taken up to show all changes of tempo then works like the popular Elgar Cello Concerto are going to have over 40 sections to indicate tempo changes. As Ruth's biographer, and having known her for many years I can, and must, emphasise that this is a symphony in one movement. I have a copy of the score before me which actually states that. The symphony, which is rooted in B minor begins with the timpani's heartbeats and lovely string writing; there are effective brass harmonies and, after the introduction, the allegro moderato is so effective because of its total simplicity. The themes are easily recalled; the solo violin (2 bars after figure B) is indeed grazioso but Bostock, or the recording engineers, get it wrong at the Piu mosso section at figure D where the percussion is not played quietly as the score instructs thus making it prominent and it sounds rather cheap. Ruth Gipps' own recording avoids this foolishness. There is a simply magnificent cor anglais solo accompanied by the harp ... the cor anglais was Ruth's second instrument; in an andante section (two bars before figure J) we have a sublime flute solo. The March is the sort of fife and drums march with prominent piccolos, that one associates with the American War of Independence. It gets closer and then dies away. The following adagio is scored for strings alone before a horn solo concludes this section. It is music of the simplest composition. If written for the piano it would not even be Grade 1 ... and yet is so effective. I am not at liberty to explain the tolling B flat bell but the heartbeats return and there is a climax and a brass section of non-pompous pageantry and the music is majestic at the end. As with the Butterworth, Bostock's tempi in the slow sections are perhaps a little too slow. Butterworth takes 36' 53" for the symphony, Bryden Thomson 36' 40" whereas Bostock is 40' 09". Ruth Gipps takes 21' 35" for her symphony - Bostock takes 23' 57" and loses some of the tautness and continuity. Nonetheless the music is lovely and a good contrast to the serious drama of the Butterworth. Perhaps some will take up these composer's other symphonies. Bryden Thomson greatly admired Butterworth's four symphonies particularly the Sinfonia Borealis and both Walton and Bliss praised Ruth's Symphony No 4 which is very fine indeed. I enjoyed reading your crit re. Butterworth/Gipps on the internet. I just wanted to come back to you on a few small points. - the idea to track the sections of the Gipps Sym. was (unfortunately) not mine, but I do find it useful, and many people have said the same. It is still clear, and indeed explicitly stated that the sym is in one movt. That is the important thing - that the composer's intentions are respected. Of course, if you just listen to the CD you are not aware of the tracking and the piece is de facto in one movement. But for broadcasters the tracking is useful (in fact it already has been!) and for anyone else wanting to listen to a section. Despite its one movement, the work has clear structural sections - they are not just tempo changes (as in the Elgar concerto you mentioned - to track those would be daft, I agree). - I have a recording of Ruth Gipps conducting her sym with timings almost identical to the CD. Indeed I had listened to the composer's own interpretation in preparing the recording as it was unfortunately not possible to meet her personally. - the long pauses (bars 2 & 4) in the Allegretto of the Butterworth Sym are not original and the composer doesn't want them! I discussed this with him in detail beforehand. They are not printed in the score, but were added later in pencil (in order to give the timpanist time to re-tune the drum after the glissando). I feel the pauses sound ridiculous, as does Arthur. It is the constant flow, through steady tempo, which seems important from the outset. - I agree with you that some tempi might be a little spacious on the CD. Arthur, however, has let me know he prefers the tempi as they are on the disc, particularly the slow movt., and indeed has been kind enough to describe it a "the definitive version"of his 1st. Of course, all of this is subjective. Believe me, I - and CLASSICO - appreciate the attention you and the team (Len, Rob etc.) pay to the series. Indeed, I think you are doing sterling work in general. A warm thank you. So, please take my comments here as personal responses which might be of interest to you. Arthur Butterworth was unable to attend the recording because, by one of those strange coincidences, he was attending a Birthday celebration performance of his Fourth Symphony at Warwick Arts Centre.